My husband Chris and I have two children, Parker and Lilly. 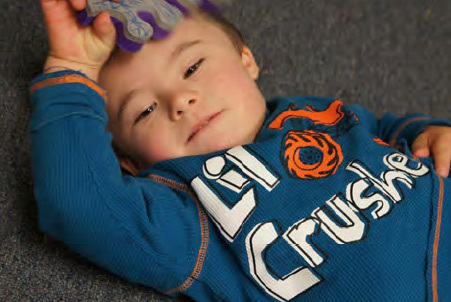 Parker loves cars, dancing, playing music, and also happens to have Down syndrome. When Parker was born three years ago our world changed. Parker was born with pulmonary hypertension on top of his Down syndrome diagnosis; we were working with a huge medical team, and were completely overwhelmed and exhausted. Once Chris and I were able to talk with each other about Parker’s diagnosis, we decided that we were going to treat Parker just like we would treat any of our other children in the future. Together we talked about our hopes and dreams for Parker, and one of those included the dream that Parker would grow up in inclusive educational settings. Fast-forward three years and here we are…the transition to preschool. I never realized how much of a rollercoaster it would be -- lots of ups but also lots of downs. As an Early Childhood Special Education Teacher I work with children with disabilities in inclusive settings, so I always took it for granted that it would be easy to find the perfect preschool for Parker. I also participated in the NWDSA’s first Kindergarten Inclusion Cohort when Parker was just two. I was interested in the cohort professionally, so I could help the families I work with, and I also figured it couldn't hurt to start collecting the tools I would need for Parker’s transition to kindergarten. I didn't expect to have to put them to use so soon. Parker has a July birthday, so we started to look for preschools within our community in the spring. Parker was already attending a parent-child class with Chris one day a week at a local school, so we decided to pursue preschool there. When we applied, some teachers told us that they thought Parker should stay another year in the parent-child class because he wasn't “ready” to move to the preschool classroom. We continued to advocate for preschool for Parker. I was so frustrated at times because I heard things like, “He can’t walk up and down the stairs as fast as his peers,” “He can’t communicate with us,” “He still puts things in his mouth.” I didn't know where to turn. I knew Parker had a right to be in that classroom, but I needed support. That’s when I turned to the community of support at NWDSA. I emailed Abby and Angela and explained my situation. They were the rock I needed at the time, and they helped support us by linking us to resources and also just being there for us. Ahhh, you are so sweet but I think I’m the lucky one to have Parker and all of your family, he is a gift and I recognize that and he is teaching me. The path to inclusion is rarely easy but it is always right! Parker has the right to be in a school setting with the peers he will grow up with but sometimes we have to fight for that. I am thankful for the support I get from NWDSA and other parents I have connections with. I would be happy to support any other families that are on this rollercoaster ride. We all need support at times!